Tom Dunsirn started the company after college with his love for hand thrown pottery. 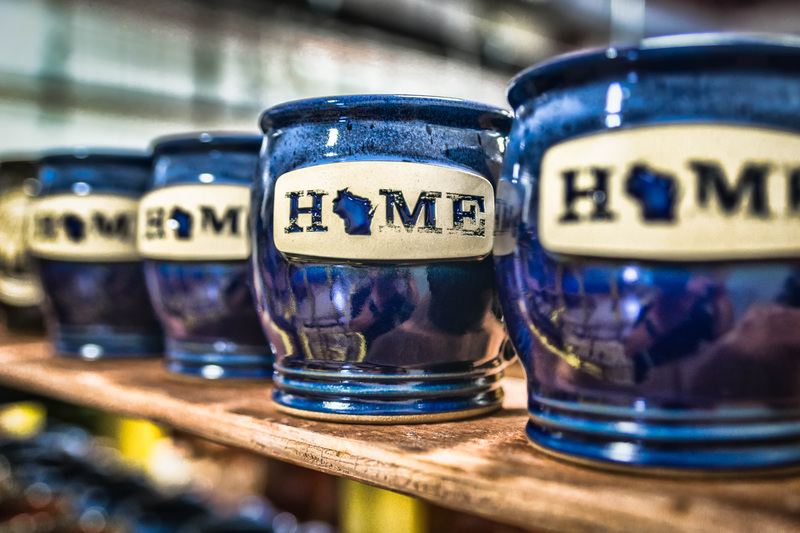 Originally named Fox Valley Stoneware, Tom and a friend turned clay slugs into mugs from a deserted firehouse located in Dale, a small township outside the Fox Valley. The first lease was handwritten in pencil on the back of a placemat and that pottery studio became the company’s location for the next 14 years. Their first customer was Wally’s Still, the neighboring bar and restaurant to their pottery studio. With 3 kilns in place the two employees could fire up to 600 mugs at a time allowing them to put 200 pieces in the bisque stage of production, with another 80-100 pieces in the high fire stage. The team worked 10-12 hour days, 7 days a week throwing pottery trying to make a go of the company. From a marketing side, the company name didn’t feel right. One night after a long day of work, Tom watched one of the most amazing sunsets he’s ever seen. He will tell you that “it was the brightest orange glow that covered the entire sky; it was beautifully stunning,” Coincidentally, the sun was setting behind rolling hills. Can you see where this is going? Sunset Hill quickly came to mind and with the simple addition of ‘stoneware’, Sunset Hill Stoneware became the official name – and soon a new image and catalog was available! From the beginning, Tom’s parents helped out. Duane, his father, loved the product, but wasn’t sure this was the right career path for his son. Duane would stop in the pottery shop, observe the activity and help out by engineering new tooling and processes to support the business. When Tom opened a retail store down the road from their Dale studio, he depended on Mary, his mom and her creative skills to create eye-catching shelf displays. In one way or another, Tom and his parents became entrenched in the pottery-making business. Tom was producing a quality-made product, selling to retailers and managing a retail store. It was during this time period, that the popular handmade SHS snowman mug was introduced. In these early days, one of the most significant SHS hires was Jason. Fresh out of high school, he started as a potter and filled in where necessary. Jason had the same deep-seated work ethic as Tom – doing whatever it took to get quality-made product out of the firehouse facility. More on Jason in a little bit. About 2003, the company evolved again. Tom updated their brand image, closed their retail location so the small team could focus 100% on producing stoneware. Their customer base for corporate businesses, well-recognized coffee shops and retailers across the country was growing. Business continued to magnify. Word was getting out and the demand for the quality-made mugs increased. A specialty coffee company requested 17,000 hand thrown mugs for Christmas – could we do it? Absolutely! The team took it on and worked day, night and weekends to fulfill that one order and many more. Like many small business owners, Tom was balancing the act of owning a small business while having the right people, product and promotion in place. He was responsible for growing sales with the ultimate end goal of delivering a well-made, hand-thrown product shipped out on time. With another new product catalog in place, the demand from corporations, eat and drinking establishments and national landmarks was mounting. In 2010, Tom and Duane became official business partners. At that time, they made slight updates to their brand and began surrounding themselves with a team of talented people. Duane used his background of ingenuity around productivity and safety to implement leading-edge, environment-friendly technologies into the business. By 2012, Tom and Duane had introduced a new interactive ecommerce site enabling customers to design their own mugs. As the company’s database of national landmarks, parks and coffee shops rose; the business needed to expand with them. That same year, Sunset Hill Stoneware left their original 2,500 sq. firehouse manufacturing site to relocate their production facility to Neenah. The new 10,500 sq. location housed 26 kilns and kept 7 pottery wheels spinning to meet customer demands. In 2013, the company was recognized as a Master Craftsman by Discover Wisconsin, the nation’s longest running tourism television show. In addition, a new retail location was opened at The Hang Up Gallery of Fine Art in downtown Neenah. Many local community members started finding Sunset Hill Stoneware products for the first time – even though as a company we were then celebrating 15 years. In 2014, Sunset Hill Stoneware began to align themselves with outside resources to offer customers additional made in America quality pieces. These carefully-chosen Trusted Partners provided exceptionally-made products that met our quality standards and turnaround at an affordable price points. Customers could now buy beautiful hand thrown stoneware mugs with highly absorbent, made in America UnderWare™ coasters. In 2015, the two owners turned the industry upside down by putting the health and safety of their employees first. While continuously trying to protect their employees from circulating clay dust within the facility, it was a difficult task to control without major investment in clean-air systems. Their investment paid off when an independent environmental firm confirmed that their efforts and circulation systems maintained the continuous flow of fresh air desired – and beat stringent OSHA requirements. In our 20th year, at the core of everything we do is maintaining the craftsmanship of years past and combining that with modern-day standards. Our goal is to hand make functional pieces that can be used safely on a daily basis and shared with those you love. We’re not going to get stagnant in our efforts. We understand that it’s not how long you are in business that counts – but how well you’ve managed your business, treated your employees, your customers and the world around you throughout the years. Remember when I mentioned Jason earlier? Well, for a short time he left SHS while he went off to college and traveled some. After a few years Jason found himself back in Dale throwing clay mugs. Today, you’ll find him managing 30+ employees at our Neenah production facility. Jason is instrumental in developing new product styles and glaze colors, training new hires and continually educating the team on new processes and efficiencies. After 20 years, Tom and Duane remain active in the business. Oh, the physical work days and weeks are bit shorter than those in the early days but their minds are always on the business. Tom keeps everything going, while Duane tinkers in the background on new technologies that will make us better as people, as a company. We have recently implemented a custom integrated MRP system with touchscreen technology to manage our manufacturing processes. Finally, thank you. The support that you have showed Sunset Hill Stoneware throughout the years, simply wants us to earn your business over and over again. Your relationship is like an old friend that we never want to part ways with. Call us to set your image in stone(ware). Our team would be happy to hear from you. Have any questions about the history of Sunset Hill Stoneware? Ask us in the comments below.